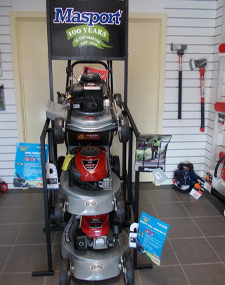 About Hightek Small Engines - Echuca . . . .
Hightek Small Engines were established on the 1st of April 2003 in Echuca offering a large range of mowers, ride-ons, garden tools and small engines to the general public. In April 2012 Hightek Small Engines relocated to new premises at 1/43 Mundarra Road Echuca, 3564. Hightek Small Engines are open Monday to Friday as well as Saturday mornings and can offer you a large range of products for sale as well as servicing and repairs. We have side access available which makes it easier when dropping off your heavy and large items for servicing. When you are looking for reliable and friendly service in the Echuca area, come in and see us. We currently service customers from as far away as Robinvale, Deniliquin, Cobram & Wedderburn and everywhere in between including Lockington, Mathoura, Kyabram, Elmore & Rochester.